Photography done by Jocelyn Noel Photography. Drink some wine, collect some corks. Make sure you're using real cork, not the faux plastic versions. 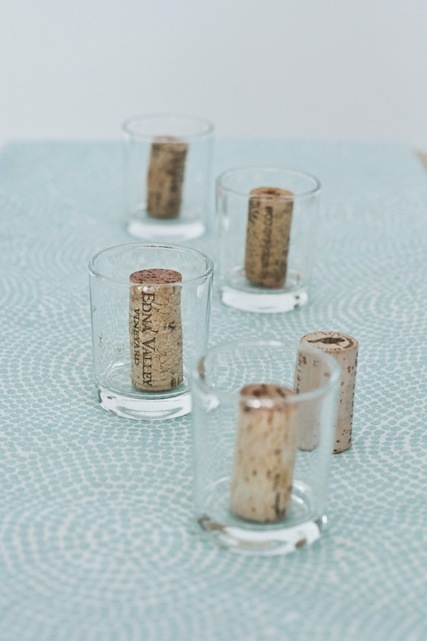 Take your corks and put them into a sealable mason jar. Fill the jar with rubbing alcohol, close and let sit for about a weeks time minimum. This allows the corks to become saturated with the rubbing alcohol. Keep the corks in the mason jar until they are ready for use. Use small glass containers or even candle holders as your stand. Light them up and enjoy your 'drunken' candles. This system also works as a fire-starting method. The alcohol burns slowly from within the cork, giving you ample time to build a successful fire overtop.